Yesterday I spent three and a half hours on a golf course in the blazing heat with my son, and I thoroughly enjoyed the time we spent together. Today I’m sitting here pondering how much he’s grown and developed. Pondering how his childhood is gone. And I’m sitting here wishing I’d spent more time with him and his sister. I don’t think I was/am a bad father. But I do think I could have done more. Spent more “quality time” with them. Even spent more totally nonsensical time doing absolutely nothing “important” other than being with each other. 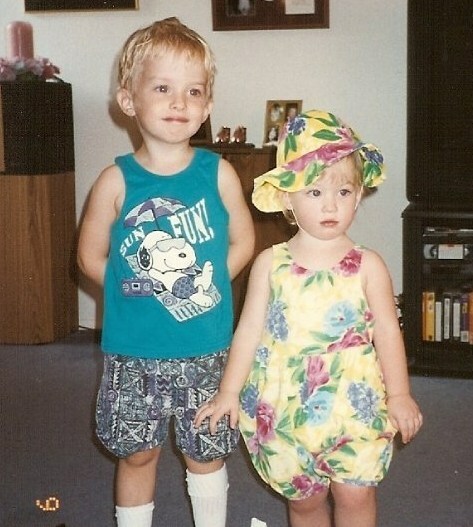 Both of my kids have grown and developed into wonderful young adults. They are smart, well adjusted, considerate and caring and empathetic individuals. Some of that can be attributed to genetics, much of that can be attributed to their Mother, and hopefully at least a small part was my doing. But couldn’t I have done more? Yes, I could have. However I can never go back and try again. You don’t really get “do overs” in parenting. Maybe it’s normal to sit back and reflect when your children reach these ages. Do that, and the “woulda coulda shoulda’s” come rolling in. Was I the best father I could possibly be, every single day? No, I was not. All too often work takes over. The daily grind, the trials and tribulations of life, those things tend to take over and consume us. Obviously I had to work — after all the kids need shelter, food and clothing. But work doesn’t equate to love. And oh how I do love my children. More than life itself. I would do anything humanly possible to protect them. That’s why when they drive away to school, to work or to just hang with their friends I still worry about them. I trust my children completely — maybe more than I should. I know they will make solid decisions. Oh, they will make stupid decisions too, we all do — I still do at 50 years of age. But I worry about them when they are out there in the world, in a place where I can not protect them. A place completely out of my control. I also realize I can’t always be there. Part of growing up is learning to live on your own. To make choices. To live, and to learn. That doesn’t stop me from wanting to protect them though. And nothing stops me from wondering what more I could have, and should have, done as their father. Despite being 50 years of age I have many young friends that are just starting their families. While I am not really in any position to give them advice — everyone parents differently — I will say this to them: You can not spend too much time with your kids. Trust me, you don’t want to be sitting there 10, 15, 20 years from now wishing you had done more as a parent. Enjoy your children while you can; be there for them every moment that is humanly possible. They grow up really really fast. Laugh with them, cry with them, share with them and love them like there is no tomorrow. Thanks for sharing those GREAT thoughts Jay! Absolutely wonderful insight. I needed to read this. Thank you for banging these words out on your keyboard. Yeah, he’s seven and I love my boys. Awesome Todd. Here’s to many more best adventures ever! Great read. As someone who is expecting, it is a good reminder to savor the times I am dreading (3 hour apart feedings, diaper changing, lord knows what else…). The dreadful times will be FAR outweighed by the amazing times Sara. You’ll be a wonderful Mommy! This weekend I had an AH HA moment, about my 4 1/2 year old son. My wife and I have been trying to figure out what does he really like. So we all went to Target and bought a baseball, bat and glove and headed to the park. I threw a few and he really smacked’m. After about 5 pitches and hits his attention just left. We walked a bit and he then saw this trail off to the right. “Dad!!! Let’s go exploring!!! That is when it hit me. My little boy is an explorer. He did great hitting the ball, but it wasn’t what he wanted. Later this week we have plans to go exploring again and I haven’t seen him more excited. Love that story Jody! Exploring is cool. Great post Jay! Looking forward to having kids one day. There’s *nothing* like it Alex! I don’t have any children, but I do have family and friends who mean a lot to me. This is an important reminder to spend time with everyone who is important to us. Really enjoyed the article! Thanks Maureen, glad you enjoyed it! And yes, spending time with family and friends is important too!